We’ve seen those scary DIY videos of peel off masks going wrong, so we want to set those wrongs right. 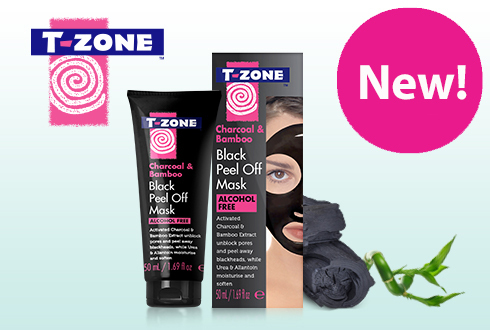 First grab a T-Zone Charcoal & Bamboo Black Peel Off Mask from Superdrug for £4.99, they’re available in store and online but sell out fast, so be quick to buy one! Start by cleansing your face with the Ultra Purifying Face Wash and pat your face dry. This ensures all makeup has been removed and any dirt or oil sitting on top of your skin doesn’t interfere with the mask. Next steam your face for 2-3 minutes or prepare the skin with a hot towel for 3-5 minutes to open pores. Or if you’ve just had a shower or bath, the steam from the water will help to open your pores too! This is a really important step as it allows the mask to grab onto dirt and oil blocking pores and lift them clean away. Pat dry your face afterwards. Apply a medium and even layer to areas prone to impurities, such as the nose, side of nose, forehead and chin. We recommend you apply to these areas first before trying on the rest of your face. Avoid the eye area, eyebrows, hairline and lips because the mask can become painful to remove from these areas. Leave to dry for 30 minutes or until completely dry. Why not check out the T-Zone Instagram page and share your mask selfie with #MySkinMyTZone? After it’s completely dry, gently and slowly peel off the mask from the outer edges and rinse off any residue. If it feels too uncomfortable to peel off, remove by rinsing off with warm water. Finally, check out all the gunk the mask has removed from your pores! Your skin will feel cleaner and smoother, as well as your blackheads and pores will be less visible. Check out out Black Peel Off Mask Tutorial video or drop us a question on Twitter or Facebook.